Churches of Christ throughout the world are pleading for the restoration of the original Christianity of the New Testament. Perhaps you ask, "just what do you mean by this?" The question deserves a clear answer. Restore is defined "to bring back to or put back into a former or original state" (Webster). Applied to Christianity, it suggests that we are seeking to put back into its original state, the church of Christ. But that suggests that the church has suffered deterioration over the years. Any person who carefully reads his New Testament and then examines the Protestant/Catholic "versions" of Christianity will be struck by the differences in the original and the modern varieties. Every aspect of primitive Christianity has suffered from attempts of men to change it to their liking. The form of church government has been changed from simple congregational government over the universal church (Compare Ephesians 1:22; Philippians 1:1). Names by which the church was known have been eclipsed by denominational names such as Anglican, Methodist, Lutheran (cp. 1 Corinthians 1:1; Romans 16:16). The recipient of baptism has been changed by many from believing adults to infants (cp. Mark 16:15-16). The form of baptism has been altered by many from burial by immersion to pouring or sprinkling water upon the head (cp. Rom. 6:3-5). The creed of the church has been displaced by human doctrines that overshadow the will of Jesus (John 12:48; 2 John 9-10). The form of worship has suffered as additions and subtractions have been made (cp. Acts 2:42; Eph. 5:19). The gospel plan of salvation has been obscured by schemes advocating salvation by good works or by faith alone (cp. Acts 2:37-40; James 2:24). The unity of the church has been shattered by denominationalism with its myriad of competing bodies (cf. John 17:20-23). These and other changes have robbed believers of a clear vision of what Christianity was originally like. The seriousness of the matter is seen when we recall that an all-wise, infallible God designed the church and that sinful, fallible men have presumed to change it. No one can ever hope to improve on God's work. To restore does not imply that we create a new denomination better than existing ones. Christ built his church (Matthew 16:18) and declared it to be "one body" (Eph. 1:22; 4:4). Denominational division is condemned in Scripture (1 Cor. 1:10; Rom. 16:17). Even a better denomination would still be unacceptable, for it is the work of men competing with the true church of God. It is not in man that walketh to direct his own steps or build his own church (Jeremiah 10:23). We do not propose to reform an existing denomination. Martin Luther and John Calvin set out to reform the corrupt, medieval Catholic church. They learned as did others that such institutions are impervious to reform. A reformation is an "amendment of what is defective, vicious, corrupt or depraved" (Webster). Had the reformers succeeded in correcting some or all the abuses of Catholicism, the finished product would still have been the Roman Catholic church, not the church of the Lord established in Jerusalem (Matt. 16:18). Our goal is to go beyond all the sects and denominations which have evolved, to the original Christianity preached and practiced by the apostles of Christ. The church which Jesus established was exactly what God wanted it to be. Its faith, worship and practice perfectly met the needs of humanity. Every attempt by uninspired men to improve upon, or modernize Christianity has only succeeded in corrupting it. The collector of fine art objects does not settle for an imitation, no matter how fine. He diligently searches until he finds the original. So do we. Like the jewelry merchant, having found the pearl of great price, we are willing to invest all to possess it (Matt. 13:45-46). We would be simply Christians, nothing more. Since the words of Christ will judge us in the last day (John 12:48), those words must be heeded in this life. In restoring the church of the New Testament, we would not seek to be like the church at Corinth, Jerusalem, or Laodicea. Every congregation then as now was made up of human materials. While the design and blueprint of Christianity was conceived in heaven, the disciples that constitute a congregation are always human, and prone to sin (Rom 3:23). As a consequence, every congregation reflects that human weakness in imperfection. Some are good but others are average or poor. But the ideal is set forth in the divine plan and every Christian in every age should strive to measure up to it. If we dedicate ourselves to following the Bible in all matters of faith and practice, then we will be the same kind of Christians as were the apostles. The idea of restoring New Testament Christianity has a universal appeal to all men. It looks to that one universal church founded by Jesus who is its savior (Matt. 16:18; Eph. 5:23). A universal book (the Bible) is set forth as the only rule of faith and practice, the only authoritative and complete repository of all that is necessary to serving God and preparing for eternity (2 Timothy 3:16-17). Its confession of faith is universal; that Jesus Christ is the Son of God (Matt. 16:16). Universally accepted Biblical names are used: Christian, disciples, brethren, saints, church of Christ (Acts 11:26; Matt. 23:8; Rom. 16:16). Its teaching on baptism and the Lord's Supper is universally appealing for they are observed precisely as Christ instructed (Mark 16:15-16; Colossians 2:12; Matt. 26:26-29). It has a universal aim which is to exalt and spread the kingdom of God on earth as it is in heaven (Matt. 28:18-20). Wearing the name of Christ to the exclusion of all human names. . . Faith in the living, reigning, Christ as the only creed of the church. . . The New Testament of Christ being the church's only book of discipline. . . 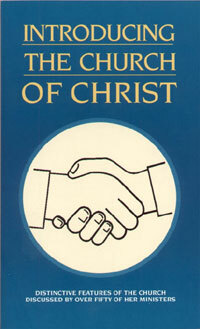 The recognition of the complete authority of Christ over his church. . . Christ's one church being exalted above all manmade institutions. . . All the commands of Christ being obeyed by his people. . . The ideals of Christ exemplified in the lives of all who wear his name. . . Unity in Christ by faith, repentance and baptism into him? This would supersede all denominationalism to the end that there should be one body with Christ as both head and foundation. The concept of Restoration is not new. It is an ancient and constant need in religion. Students of church history find many voices who made this plea. It is not a local movement. Around the world independent groups have sprung up with the announced goal of restoring original Christianity. This common commitment cannot but bring these disciples together in Christ if sincerely followed. It is not a governmental or institutional movement. Rather, God-fearing individuals are making their way out of the darkness of religious confusion into the pure light of God's eternal truth. It is our prayer that you too will commit yourself to be an undenominational, New Testament Christian, a member of the church one reads of in the Scriptures. What is the difference in restoration and reformation in religion? Discuss the church of the Bible that should be our pattern. Where would we look for guidelines for restoring the church? What is the difference between Christ's original church and a modern denomination?